PowerVC V1.2.3 Fixpack 2 is now available for download from Fix Central. Many IBM PowerVM clients use multiple (aka “logical”) processor pools to control the amount of capacity available to middleware applications to manage software license costs. This PowerVM capability allows automatic movement of processing capacity between LPARs/VMs while keeping a hard limit on the total capacity available to the application. 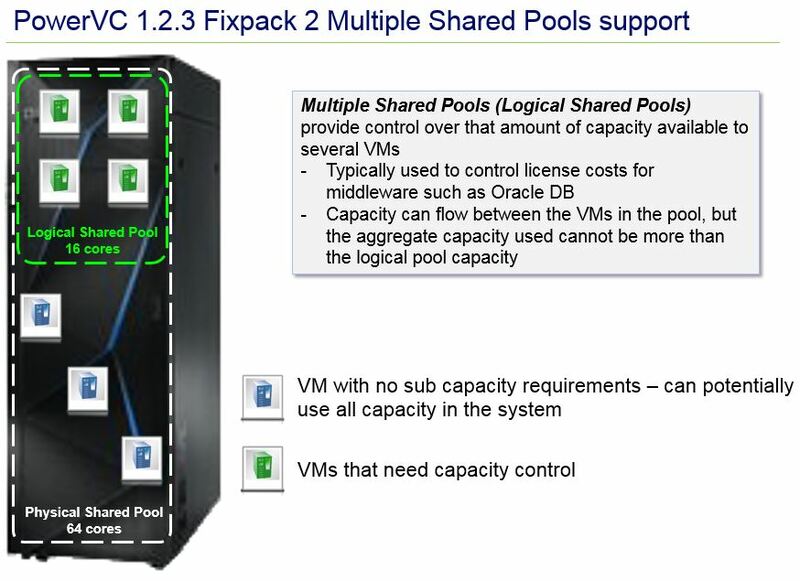 With PowerVC Fixpack 2, administrators can specify that a VM is deployed to a specific shared processor pool other than the PowerVM default pool (Pool 0). Fixpack 2 also adds support for clients to increase the size of data volumes in the PowerVC graphical user interface. This capability was previously only available through PowerVC programming APIs. This entry was posted in AIX & Power Systems Blogroll, Cloud and tagged PowerVC PowerVM Cloud. Bookmark the permalink.